Christine Savory LOVES her job. 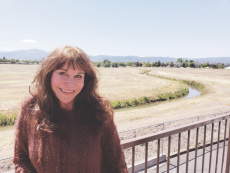 She is the owner of Healing Beyond Hypnosis and Abba-Father Counseling in Medford and is a certified transpersonal hypnotherapist. She created her own system of healing utilizing EFT, EMR “Emotional Meridian Release”, Ho’oponopono “ancient Hawaiian healing systems”, hypnosis, NLP, gratitude therapy, guided visualization therapy, life coaching, SPIRITUAL ENHANCEMENT TECHNIQUES – all utilized to help clients go from where they are, to where they want to be. In addition to the training in the above modalities, she earned her BA and MA at the California State Polytechnic University. 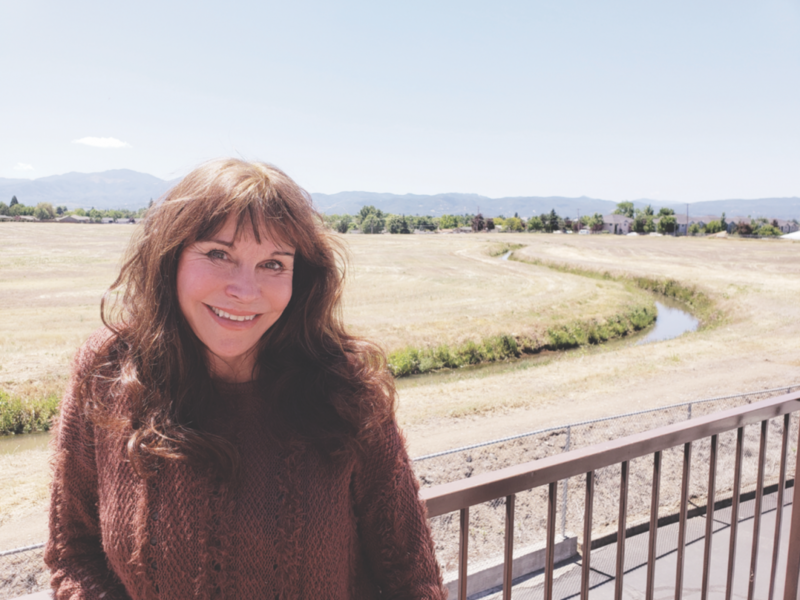 Her training has been ongoing since college, benefiting from life lessons, including raising 16 foster children, teaching 25 years in alternative high school programs, experiencing pain and victories that helped her learn the power of gratitude to transmute the tragedies of life into power of transformation. 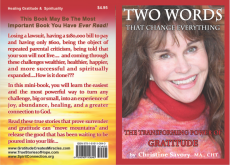 She teaches workshops based on her book, Two Words That Change Everything – The Transforming Power of Gratitude. Hi Christine, thanks for speaking to us today and doing this interview. I love to share what I am doing. Thank you for providing a platform. To begin with, can you tell us a little bit about your professional training and background? I earned a Master’s Degree in Education and Psychology at California State Polytechnic University. I pursued my love of teaching and received my two life credentials. I was drawn into counseling and teaching high-risk teens, and spent 25 years working in alternative education programs. My husband and I expanded our desire to help teens and pre-teens by parenting foster children for 11 years. Life experiences caused me to search for answers as to why people suffer, and have painful lives. I always had a deep desire to help learn the purpose of suffering and to help alleviate pain. I began by searching spiritual teachings and a deeper study of psychology. The power of the mind, sub-conscious, and super-conscious was my primary focus. Jesus’ words “What you believe in your heart (feelings) is done unto you” was a truth that helped me see how my subconscious beliefs had manifested in my life’s issues. The remedy was to change my beliefs. I searched for how to change those beliefs, applied that discovery of how to change them, and it resulted in changed life situations, and a desire to help others by what I had learned and applied. This search culminated in seeking spiritual guidance, then subsequently receiving training and certification in Transpersonal Clinical Hypnotherapy, Clinical Hypnosis, NLP, Reconnective Healing, and Quantum Healing Hypnosis (Delores Cannon), EFT… But my major education came from personal research daily, since I was a teenager, studying various experts in this field. All of this studying lead to teaching classes over the years to share what I had learned. Please talk about the power of gratitude and what you have experienced because of this practice in your life. When I was 18 I began reading about people who had experienced miracles coming out of tragedy by applying the principle of facing a challenge, immediately acknowledging that there was a reason for everything that happens to an individual, and that a positive outcome was hidden within the troubling situation. And that positive outcome was able to manifest IF that person surrendered to a higher power, and giving thanks FOR the blessing that was hidden behind the challenge. There was also an aspect of trust that “All things work together for good”. I then and there made a commitment to do this for every troubling situation that arose, big or little. A few years later, while in my fifth month of my first pregnancy, I went into pre-mature labor, and the attending physicians told husband and me that the child was too young to survive and in the 2% chance of survival he would be severely handicapped. I immediately went into surrender and gratitude mode, thanking God for the good that was going to come out of this experience. I went from sadness to joy in a short time as that vibration of gratitude was firmly established in my mind and heart. (It wasn’t easy at first, as the possibility of losing my son filled my thoughts with sadness). That joy not only sustained me in the 42-hour labor, but also resulted in a miracle. My son, Jeremy, lived, and was a medical miracle. (Neo-natal care for infants 40 years ago was not as advanced as it is today). There were so many unexplained miracles in his birth and early years that I can only attribute to the power of gratitude, trust, and surrendering this child’s life, and surrendering my sadness to God. This story, and the visitation of Jesus in the hospital to hold Jeremy in the incubator is one of the collection of stories related in the book. Many people who read this book and believed in this gratitude response gave it a trial run in their lives. The results were sometimes dramatic. One client gave thanks every time her husband got angry and displayed road rage. She silently worked on focusing on gratitude instead of irritation at her husband’s immature behavior. Within minutes his anger abated. A few more trial runs, and the husband ceased raging entirely. Formerly, his road rage had caused her extreme stress. It had gone on for years. But it stopped completely after this experience. One of my favorite examples is a lady who had a serious case of shingles. Pain prevented her from getting sleep at night, or sitting in a chair. Instead of seeking a doctor or pain medication, she related how she was determined to apply gratitude. She positioned herself gingerly in a recliner and said to herself, “I am NOT moving from this place until I am truly grateful that I have this very painful condition. It took her 5 hours. At the end of this experience in gratitude, she was so filled with happiness and joy that the condition took a back seat. Before that, all her attention was on her pain for weeks. The next morning there was no trace of the disease. Our thoughts and feelings determine most of our experiences that are drawn into our lives. With this power of gratitude and surrender, I have discovered, thoughts and feelings are focused on a higher level, and off of the problem. This brings a solution to the issue, rather than perpetuating painful experiences. What is interesting about the power of gratitude to change outcomes of challenging situations, both minor and tragic, is that in recent years, as the consciousness is being raised on the planet, (as dark as it appears on surface) many enlightened teachers are teaching this in workshops, and writing about this in their books. The Secret author, Rhonda Byrne’s, wrote a great book, The Magic. It is a practical “manual” with a 30-day practice to help the reader get in the habit of expressing gratitude, so that it becomes a way of life. On my site, www.GratitudeCreatesMiracles.com there is a list of books that are suggested to learn more about this life transforming power. I would also suggest any books by Annalee Skarin, an amazing lady who went through complete transformation through an hour-by-hour practice of Love, Praise and Gratitude. Her amazing account of her ill toddler dying in her arms, and her ability to surrender and thank God brought the child back to life, healed and whole. It was this story I read right before my child was to be born dead. That gave me the courage to go through this process. That also showed me the power of sharing true stories that can inspire us when going through similar tragedies. That is why I was pushed to write my book sharing true accounts of expressing TWO WORDS THAT CHANGE EVERYTHING. You have also worked with forgiveness issues. Please say more. We have all experienced times when we were hurt, rejected, abused, injured, perhaps innocently accused of wrongdoing. Many have experienced what appears to be cruelty by caregivers, mates, associates. These can leave deep scars that, unless healed and forgiven, can negatively impact every area of our lives, especially present relationships. Most people have heard the saying that holding on to un-forgiveness (anger, resentment), is like drinking poison and hoping the other person dies. Resentment, long-held anger, and un-forgiveness leaves the body open to serious diseases, high blood pressure, allergies, chronic health issues, and premature aging. Helping clients forgive is a most important requirement for full healing and opening up to happiness. Forgiveness can be done in one or just a few sessions. It is important to note here that forgiving does not mean condoning. We don’t forgive the incident, which may be reprehensible, we forgive the person that was acting out of his own pain, or in some cases, mental illness. I use EFT first, then in a trance guide the person back in time to the incident, and re-live it in “imagination” in a way that was loving and supportive. The subconscious does not know the difference between real events and imagined events. So the client is assisted in “re-patterning” the event. This is most effectively done in a light trance state, when the brain is vibrating in the “alpha” brain wave pattern. However, when a client experiences tears, he or she is automatically in the alpha state, and simply deep breathing, and imagining being held and comforted is in itself healing. Here is an example of healing childhood trauma: A female client came to me with deep fears of showering without her husband standing guard at the door. We did a regression and uncovered a buried memory of her grandfather (now passed) coming into the bathroom when she was young and molesting her. We reenacted the scene, right before the molest occurred. Because she had a relationship with Jesus, He came in and His presence stopped the attempt to molest (I did not suggest this visitation of Jesus, as I let the client experience what is meaningful to him or her). As she described what was taking place she said that the grandfather broke into tears, realizing the horror of his planned action. According to her account, he was held and healed of his mental condition by Jesus. Then, at that point, she was able to forgive and have compassion on the sobbing man. We then did a visualization of having the Holy Mother (she had a catholic background) be in the bathroom with her every time she showered. When she left my office she immediately went home to take a shower to see if the process worked. She reported to me that it did. Upon checking up on her weeks later, she reported that there was no longer any fear around this issue. Now here is the important thing about this: She discovered in the ensuing weeks, life-long allergies cleared up, and she was able to lose weight easily. Her weight had been a problem all her life. This is a typical problem of victims of sexual assault. The reason being that the unconscious mind motivates the violated one to put on extra weight to be “unattractive”. It is a survival mechanism to protect this person from further unwanted advances. It is easy to see why overweight is such a major problem in this country when statistics show that 1 out of 4 women have been sexually molested as children. The unconscious mind rules what goes on in the physical body. When memories and beliefs are healed, the body is free to heal. That is why I find this work so rewarding. An additional blessing of forgiveness, is it releases the “perpetrator” to go on in his/her growth. The grandfather was actually “stuck” in the astral realm, unable to go to the light, and be with God. He had been in the spirit for years. The reason I know of this is that his spirit actually visited me he next day. He identified himself as that woman’s grandfather. He expressed gratitude for the part I played in helping his granddaughter heal and forgive him. With tears, he expressed that he had been waiting for years for that forgiveness so that he could be released from his prison of guilt. I them heard an audible “swish” and he went up. I have had many examples of this concept of the healing of one, affects the healing of others related to that client. Several times, a client has reported that within minutes of leaving my office, they receive a call from that person who they forgave, and the message is one of love: A mother who never expressed love, now advanced in years calls to tell her son that she loves him and is so proud of him, a father calls to say he is coming for a visit and wants to renew their relationship after 20 years of no contact. This is how we participate in the healing of the world. We heal ourselves, replace anger with love and forgiveness, and it affects those around us, and those related to us. Another important aspect of growth and healing is to understand the agreements we made before we were born. I am finding that guiding a client to the deepest state (sonombalism) A client can actually travel with no time/space restrictions, and go to the spiritual realm (Heaven) to encounter Jesus, Father God, or angels, and re-experience the pre-birth experience. There he/she can experience not only unconditional love (similar to Near Death Experiencers) but witness the time of choosing his /her major life experiences, future partners, choosing his/her mother and father, choosing challenges, all with the specific purpose to enhance that person’s spiritual growth, and contribute to the unique life purpose. Being of service has always been a high priority for you. Can you explain? I think this is common for most people in the health field.Compassion is usually what motivates us, gives us a purpose. My husband and I always had an open home and heart for those who needed love.We parented many children and teens in our foster home.This was very challenging, especially for our own biological children.They sacrificed a lot for those 10 years.They no longer had the attention and time of their mom and dad.But they did amazingly.They are both exemplarity parents to their children today. They have open, caring hearts for the less fortunate. I think the hardships they endured, sharing their parents with other children who were often mean and ungrateful (reacting out of their own pain) developed their character more than they realize. I am constantly getting compliments from people I run into, bank tellers, store clerks, people on the street.“I love your daughter! She is so sweet!” ”Your son is the kindest and gentlest man I have ever met.” That is the reward of caring, sharing and loving. My constant prayer is to be of service, and to have a loving, open heart. I carry this prayer in my heart when I am with my clients.I give the person in front of me all of my attention, consciously directing love to them as they talk, unburdening themselves.That is my gift to them. That is my goal.I am very grateful for that privilege. Christine, you have done a lot of research to find the best and fastest results to bring to your clients. Tell us more. What I have learned is that trauma and emotions are stuck in the body.With the techniques of utilizing pressure points similar to acupuncture, many of these trapped emotions are released. Thus my training, and then my fine-tuning of the EFT process I morphed into ERT (Emotional Release technique). Then with a follow-up of accessing the sub-conscious mind with hypnotherapy, and NLP, the results are accelerated.All of my clients feel better when they leave compared to how they felt coming in. And many need only 2 to 4 sessions to heal the issues they came in for.However, more sessions are needed for long-term issues.Some people chose to come in on a regular basis just to clear up stresses that have come up for them that week. It’s like a regular “colonic of the soul”, as one client named it. Weekly cleansings to prevent accumulation of …well, you get the picture. You are working with your clients on many different levels. What are some of the conditions you are treating? PTSD, Stress, Anger, Low Self-worth, Depression, Lack of Motivation, Spiritual Disconnect, Childhood Trauma, Grief, Low Immunity leading to health issues, among others. Children are very open to my processes. I also have certification in Medical Hypnosis, to help clients who are facing medical procedures. Your view of hypnosis is expressed quite differently than I have heard before. What is your take on it? My approach is to DE-hypnotize people. People are walking around with these beliefs installed into their subconscious as a result of experiences -what they were told as children, trauma that makes them feel less than the magnificent creations they are. They are living a lie. We all are, to some degree until we are free of these lies, and come to the realization that we are beautiful precious beings. My greatest joy is to facilitate people discovering their true selves. Can you share a testimonial? My most recent one came in today. I had been going through an exceptionally challenging period in my life, and it became apparent that I needed help if I was going to move forward. When I read about Christine’s approach, particularly with regard to Gratitude and Surrender, I was immediately to do a session with her. Well, my intuition served me well. Christine has a special ability to put one completely at ease, creating a safe environment in which one might explore the most intimate, and sometimes dark, recesses of the psyche and spirit. The techniques she employs, are simple, but highly effective. Yet I must say that it was Christine’s authenticity, compassion, sensitivity and commitment that made it possible for me to bear my soul, release the lingering fears from my past, and re-establish contact with my inner light and guiding wisdom. I have discovered a new-found lightness and confidence since my session with Christine, and I am very grateful for that. 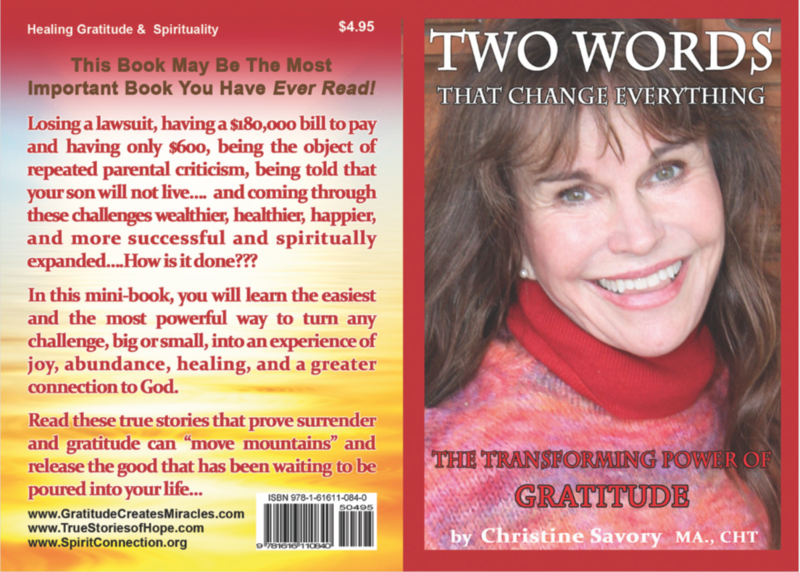 I recommend Christine Savory wholeheartedly, and without reservation. Christine, how can interested readers learn more about working with you? They can get an overview of what I do at my websites, listed at the end of this article. www.healingbeyondhypnosis.com. It is a 45-minute read that may change your life. Powerful techniques for healing and transformation.